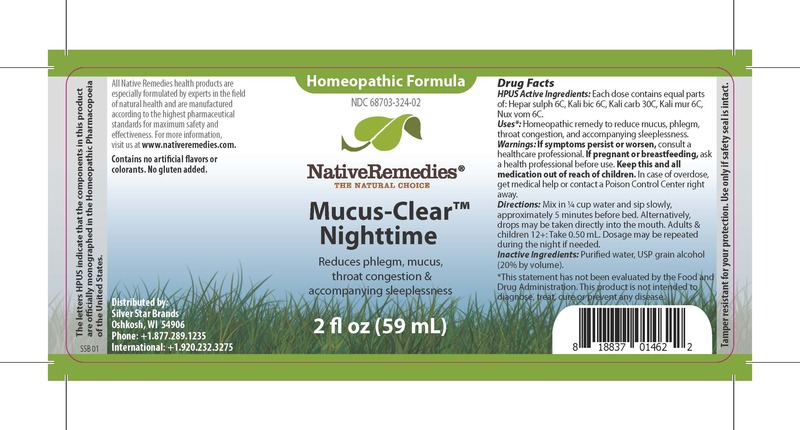 Proprietary Name: Mucus-clear Nighttime What is the Proprietary Name? Non-Proprietary Name: Hepar Sulph, Kali Bic, Kali Carb, Kali Mur, Nux Vom What is the Non-Proprietary Name? Mucus-clear Nighttime with NDC 68703-324 is a a human over the counter drug product labeled by Silver Star Brands. The generic name of Mucus-clear Nighttime is hepar sulph, kali bic, kali carb, kali mur, nux vom. The product's dosage form is liquid and is administered via oral form. HPUS Active Ingredient: Each dose contains equal parts of: Hepar sulph 6C, Kali bic 6C, Kali carb 30C, Kali mur 6C, Nux vom 6C. The letters HPUS indicate that the components in this product are officially monographed in the Homeopathic Pharmacopoeia of the United States. Uses*: Homeopathic remedy to reduce mucus, phlegm, throat congestion, and accompanying sleeplessness. *This statement has not been evaluated by the Food and Drug Administration. This product is not intended to diagnose, treat, cure or prevent any disease. Warnings: If symptoms persist or worsen, consult a healthcare professional. Keep this and all medication out of reach of children. In case of overdose, get medical help or contact a Poison Control Center right away. Directions: Mix in 1/4 cup water and sip slowly, approximately 5 minutes before bed. Alternatively, drops may be taken directly into the mouth. Adults & children 12+: Take 0.50 mL. Dosage may be repeated during the night if needed. Contains no artificial flavors or colorants. No gluten added.Tamper resistant for your protection. Use only if safety seal is intact. Inactive Ingredients: Purified water, USP grain alcohol (20% by volume). Keep this and all medication out of reach of children. If pregnant or breastfeeding, ask a healthprofessional before use. Reduces phlegm, mucus, throat congestion & accompanying sleeplessness.